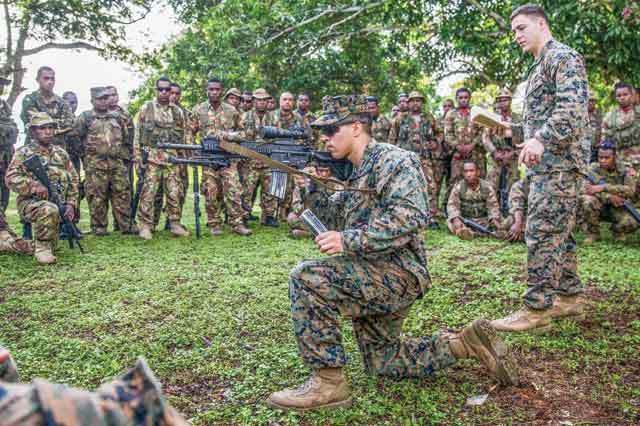 United States Marines conducted a training exercise together with Papua New Guinea army to help prepare PNG soldiers for security duties during the general election and 2018 Apec meeting. The Marines, part of the 11th Marine Expeditionary Unit, arrived on the amphibious landing ship USS Comstock (LSD 45) on Saturday. Around 100 Marines participated in exercises in Port Moresby with local soldiers over the long weekend. Training activities took place at the military barracks, Sir John Guise Stadium, hotels and parks. Commanding Officer of the USS Comstock Bradley Coletti said the trainings and the activities were to enhance the US-PNG relations to ensure a stable and prosperous Asia-Pacific region. He said they helped to enhance military capabilities with partner nations in the Indo-Asia-Pacific region, “and serve to strengthen their respective abilities to respond to emerging crises”. He said bilateral training with the PNGDF was also to strengthen the military partnership between the two nations. Local soldiers assumed control of a vehicle entry point, stopping suspicious drivers, and searching the vehicles for any contraband.